I'm so proud of my dog, Blue! He is the recent winner of a local news paper contest for cool dog, or dog picture or something. Anyway he won. He gets a free grooming. I get the satisfaction of knowing I have a good lookin' dog. 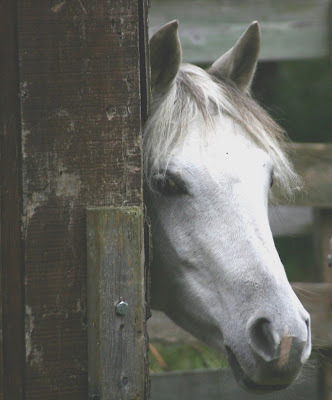 I've been noticing lately that horses almost never look me square in the eye. Maybe it's cause their eyes are on opposite sides of their heads. OR MAYBE...it's like when you see someone really hot and you want to look at them but you don't want them to know you're lookin' at em. Please feel free to comment, but don't do the "maybe you're only attractive to horses" bit. My dad taught me that you should give a little $ to the beggars on the corner. So, I try to when I can. But I'm starting to get a little frustrated. When my man is learning up against a pimped out mountain bike in a $200 pair of Carhartt coveralls...his beer breath and dirty fingernails are just a bit less convincing. Bums, they just don't make em' like they use to. This morning Ben, Roxy & I all exited our rooms at the same time. I said "look at my beautiful kids!" to which Ben responded, making a faux rubbing of a pregnant belly at me: "I thought you meant look at my beautiful children." Then he laughed at me and ran down the stairs. 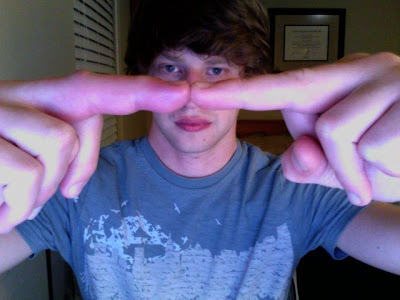 This is not Ben, it's just a pic of a swollen finger. On the way home from school today Ben was complaining about how one of his fingers was swollen. He wasn't sure why, but it was definitely bigger than the other finger. As he was asking me my take on the big finger thing, Roxy pipped in..."Ben, It's just your man finger coming in." Where does she get this stuff. I don't have anything to blog about, but out of curtisy for those who view my blog I wanted to post a more visually pleasing picture. This is my dog. His name is Blue.